He's known in some circles as 'The Fifth Manic'... the man who supplied the title of the Preachers' first post Richie album 'Everything Must Go' (which shares the same name of a play - a revenge tragedy for the 90s in Blackwood he's written. to be staged at the Sherman Theatre early next year): his quotes have appeared on the bands record sleeves too - most memorably There Is Eloquence In Screaming - a noble sentiment that cropped up on the back of 'Generation Terrorists'. 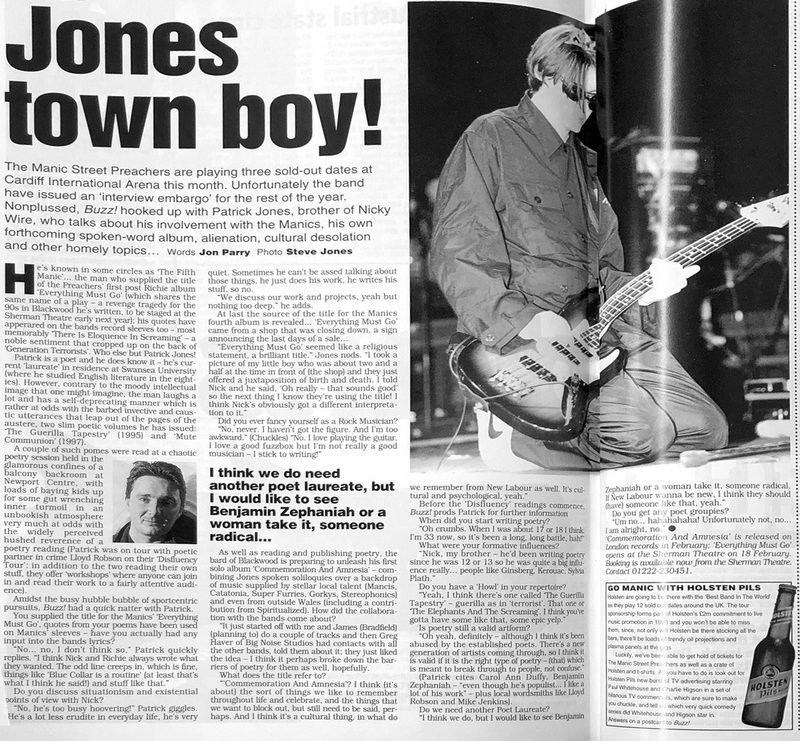 Who else but Patrick Jones! Patrick is a poet and he does know it - he's current 'laureate' in residence at Swansea University (where he studied English literature in the eighties). However. contrary to the moody intellectual image that one might imagine. the man laughs a lot and has a self-deprecating manner which is rather at odds with the barbed invective and caustic utterances that leap out of the pages of the austere. two slim poetic volumes he has issued: The Guerilla Tapestry' (1995) and 'Mute Communion' (1997). A couple of such pomes were read at a chaotic poetry session held in the glamorous confines of a balcony backroom at Newport Centre. with loads of baying kids up for some gut wrenching inner turmoil in an unbookish atmosphere very much at odds with the widely perceived hushed reverence of a poetry reading (Patrick was on tour with poetic partner in crime Lloyd Robson on their 'Disfluency Tour': in addition to the two reading their own stuff. they offer 'workshops' where anyone can join in and read their work to a fairly attentive audience). Amidst the busy hubble bubble of sportcentric pursuits. Bun! had a quick natter with Patrick. You supplied the title for the Manics Ev Must Go'. quotes from your poems have been u= on Manics' sleeves - have you actually had any input into the bands lyrics? "No... no. I don't think so? Patrick quickly replies. lies 1 an think Nick and Richie always wrote what they wanted. The odd line creeps in. which is fine. things like 'Blue Collar is a routine' (at least that's what I think he said!) and stuff like that Do you discuss situationism and existential points of view with Nick? "No. he's too busy hoovering!" Patrick giggles. He's a lot less erudite in everyday life. he s very quiet. Sometimes he can't be assed talking about those things. he just does his work. he writes his stuff. so no." "We discuss our work and projects. yeah but nothing too deep.' he adds. At last the source of the title for the Manics fourth album is revealed... 'Everything Must Go' came from a shop that was closing down. a sign announcing the last days of a sale..."
"'Everything Must Go' seemed like a religious statement, a brilliant title" Jones nods. I took a picture of my little boy who was about two and a half at the time in front of (the shop) and they just offered a juxtaposition of birth and death. I told Nick and he said. 'Oh really - that sounds good' so the next thing I know they're using the title! I think Nick's obviously got a different interpretation to it"
Did you ever fancy yourself as a Rock Musician? "No. never. I haven't got the figure. And I'm too awkward? (Chuckles) 'No. I love playing the guitar. I love a good fuzzbox but I'm not really a good musician - I stick to writing!" As well as reading and publishing poetry, the bard of Blackwood is preparing to unleash his first solo album Commemoration And Amnesia' - combining Jones spoken soliloquies over a backdrop of music supplied by stellar local talent (Mantis, Catatonia, Super Furries, Gorkys, Stereophonics) and even from outside Wales (including a contribution from Spiritualized). How did the collaboration with the bands come about? "It just started off with me and James (Bradfield) (planning to) do a couple of tracks and then Greg Haver of Big Noise Studios had contacts with all the other bands. told them about it: they just liked the idea - I think it perhaps broke down the barriers of poetry for them as well, hopefully. What does the title refer to? "'Commemoration And Amnesia? I think (its about) the sort of things we like to remember throughout life and celebrate, and the things that we want to block out, but still need to be said, perhaps. And I think its a cultural thing. in what do we remember front New Labour as well. It's cultural and psychological. yeah." Before the 'Disfluency' readings commence. Buzz! prods Patrick for further information When did you start writing poetry? "Oh crumbs. When I was about 17 or 18 I think I'm 33 now, so it's been a long. long battle. hater What were your formative influences? "Nick. my brother - he'd been writing poetry since he was 12 or 13 so he was quite a big influence really... people like Ginsberg. Kerouac, Sylvia Plath." Do you have a 'Howl' in your repertoire? "Yeah, I think there's one called The Guerilla Tapestry' - guerilla as in 'terrorist'. That one or The Elephants And The Screaming. I think you've gotta have some like that, some epic yelp.' Is poetry still a valid artform? "Oh yeah. definitely - although I think it's been abused by the established poets. There's a new. generation of artists coming through. so I think it is valid if it is the right type of poetry - (that) which is meant to break through to people, not confuse. (Patrick cites Carol Ann Duffy, Benjamin Zephaniah - "even though he's populist... I like a lot of his work" - plus local wordsmiths like Lloyd Robson and Mike Jenkins). Do we need another Poet Laureate? I think we do. but I would like to see Benjamin Zephaniah or a woman take it, someone radical. If New Labour wanna be new. I think they should (have) someone like that. yeah." Do you get any poet groupies? "Um no...hahahahahaha! Unfortunately not, no... I am alright...no"
This page was last modified on 20 June 2018, at 17:22.